I am very thrilled to be able to show this post. 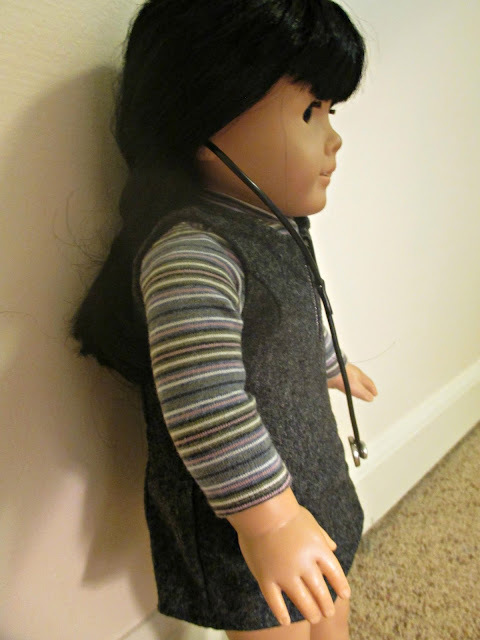 Someone locally, whom I barely know, showed me a complete doll outfit that she had made with scrubs, a doctor's coat and a stethoscope. I was particularly impressed with the stethoscope. I had never heard of anyone making one. She made me my own! So sweet and generous! Here is the stethoscope on its own. She used rubber coated wire. There are beads for the earpieces. The part that doctors used to listen is made from a fabric-covered button, minus the fabric. It's so creative and it looks so great! It's really hard to get good pictures in the winter, sorry. The dolls can really wear it in their ears! Anne is starting to consider a career in medicine now!